The weather obliged, thankfully, permitting many to dress in Edwardian-period clothes and brighten up events. From early on people gathered for a breakfast of mutton kidneys in various restaurants and pubs, before starting to make their way along the route set-out in James Joyce’s Ulysses. The celebration of one of the most famous days in literature has grown from a tiny beginning in 1954 to become a worldwide event. From Auckland to Arklow, Sydney to Skibbereen and New York to Nenagh groups arranged events to remember the great writer, something that is growing with each passing year. Around one o’clock I met a few friends and we made our way to Sweny’s Pharmacy on Lincoln Place. The place was packed with a babel of accents filling the tiny, time-warped pharmacy. 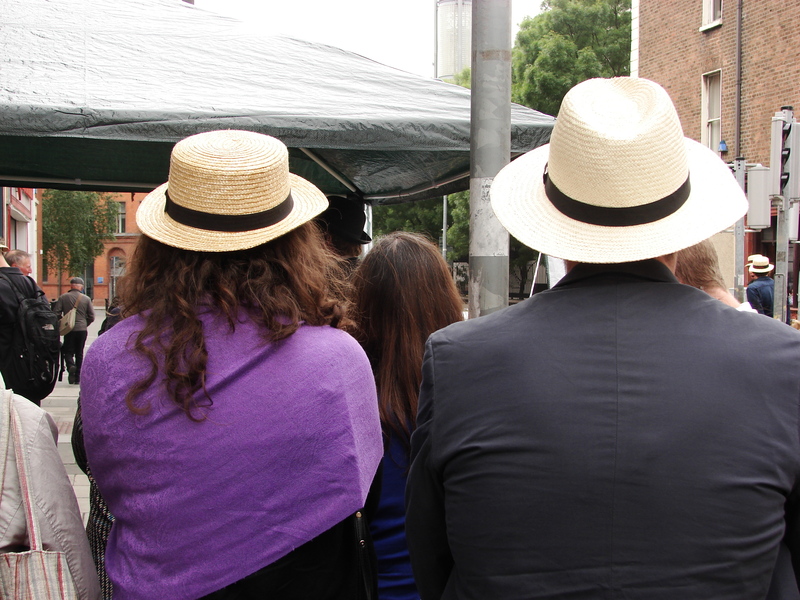 The strong smell of lemon soap wafted onto the street where a large crowd gathered to hear Shane Egan reading The Bloomsday Boys. Having written the short story, I was delighted to see and hear it performed in Dublin on the big day, and Shane certainly did it justice. His strong, clear projection brought the story to life as he moved about the packed pavement. 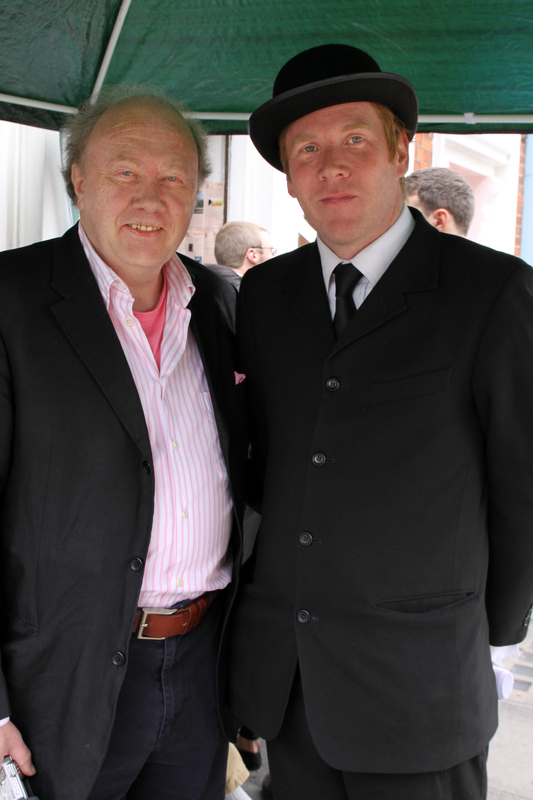 He was dressed in a black suit, white shirt, black tie and, of course, a black bowler hat – his image neat and convincing. The crowd listened in rapt attention as Shane began; then laughed at the antics of the characters in the story, before breaking into a rousing version of Cockles & Mussels at the end. I was absolutely thrilled with the performance, and I’d like to think that JJ himself would have approved, and tipped his hat in acknowledgement. It was, indeed, a great Blooming day! Well, after much effort my book is finally finished. Needless to say there were some issues that had to be addressed, and, thankfully, they are all now resolved. The finishing process just never seemed to end – it was quite an eye-opener. Click on the image below for a preview of the ebook. Now it’s time for the next project. 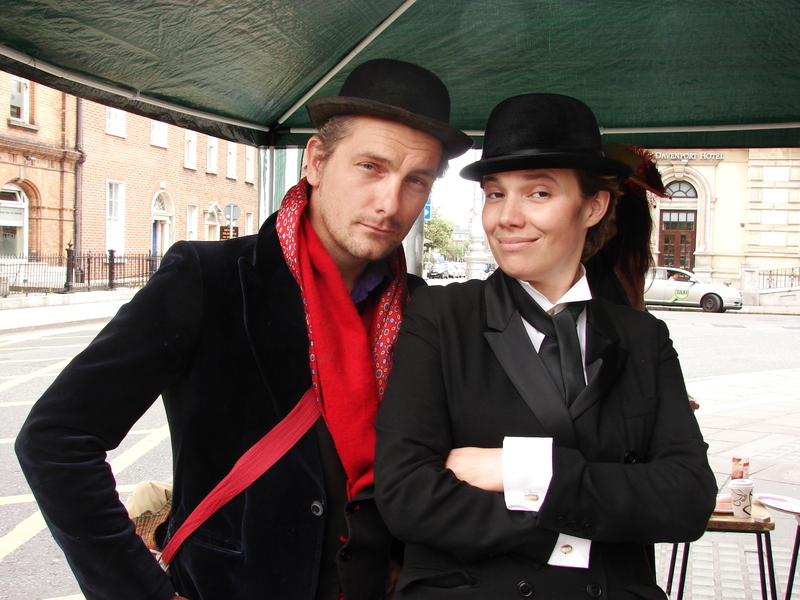 Bloomsday: The city is gearing up for the annual celebration of all things Joycean. There are many events on around the place, and we’re all hoping for some good weather. 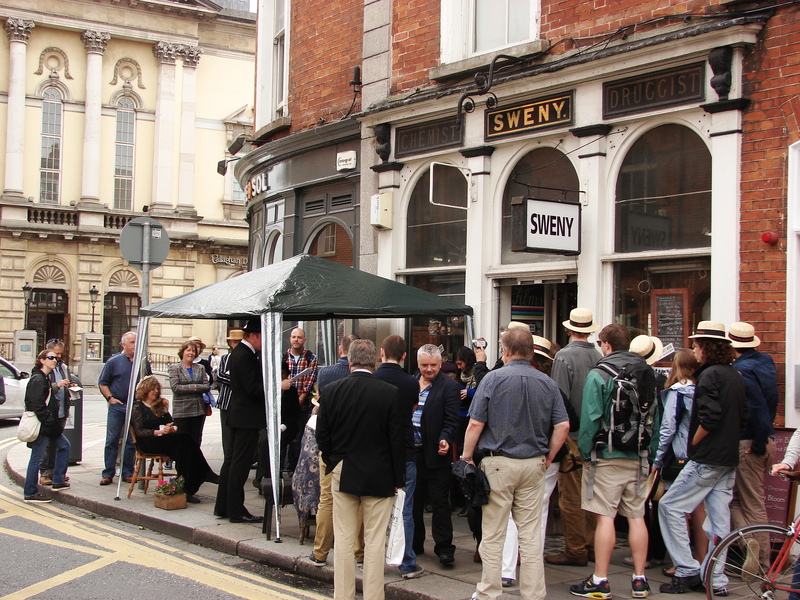 The James Joyce Centre has plenty on offer, as does Sweny’s Pharmacy which is always lively and well worth a visit. And don’t forget to buy a bar of the famous lemon soap! But whatever you’re doing, have a great day and raise a glass to Jimmy. Check out the video below for a quick look at some of the places and people featured in the ebook.